Please be sure to read all six of our articles in our Responding to the Critics series on the Israel Only false doctrine. Number One begins here. In the previous articles I have shown that Israel was “among the nations”– she was not the nations, and this is even now being admitted by the IO camp! This is a fatal admission! Paul is very clear in Romans 11 that the Gentiles were not Israel and Israel was not the Gentiles. In article #4 I discuss this at length, and to this date not one IO apologist has answered these facts. Now, notice that in Revelation we find the salvation of “all Israel” i.e. the salvation of the righteous remnant under the imagery of the 144,000 out of every one of the twelve tribes. The number 144,000 should certainly not be taken in any literalistic numeric sense, or else that would mean that only 144,000 of the lineage of Abraham were saved!! If one attempts to make that number literal, then since the 144K were the first fruit of those redeemed to God, by accepting Christ, and since the 144K would come out of the Great Tribulation, then of necessity that means that no Old Covenant Israelite was saved, because they were not the first fruit! They did not come out of the Great Tribulation! None of the OT saints had washed their robes in the blood of Christ! After these things I looked, and behold, a great multitude which no one could number, of all nations, tribes, peoples, and tongues, standing before the throne and before the Lamb, clothed with white robes, with palm branches in their hands, and crying out with a loud voice, saying, “Salvation belongs to our God who sits on the throne, and to the Lamb!” All the angels stood around the throne and the elders and the four living creatures, and fell on their faces before the throne and worshiped God, saying:“Amen! Blessing and glory and wisdom, Thanksgiving and honor and power and might, Be to our God forever and ever. Amen. (Revelation 7:9f). Do you catch the power of this? We have the salvation of “all Israel” but then, in addition to that, we find, “a great multitude which no one could number, (from arithmos) of all nations, (not just 12 – DKP!) All tribes, (not just 12 tribes – DKP!!!) peoples, and tongues.” These are not and cannot be only “Israel of the twelve tribes” because the twelve tribes are already mentioned. The “all nations” and “all tribes” are in addition to the twelve tribes! This totally falsifies the IO claim that “nations” refers to the Ten Northern tribes. These are “Gentiles” in the truest sense. They are not of the physical lineage of Abraham. They are “pagans” who have become the Seed of Abraham by faith; but they are not “Israel after the flesh.” Of course, it is to be noted that one IO advocate, in a YouTube video that I listened to (for only a few moments) stated no less than three times that foreigners could clearly join themselves to Israel, and that no one doubts it! Really? That is false! The very premise of IO is that no true foreigner, no true “non-Israelite” could ever join themselves to the God of Israel! These facts totally falsify the IO position, since they insist that it was only Israel, fleshly Israel, that was saved in AD 70. (Just recently, on FaceBook, one IO proponent commented on the 144K and tried to give the impression that Revelation 7 & 14 speaks only of Israel – totally ignoring the vast multitude! But, the vast multitude, beyond number, is patently not Israel in Revelation 7 & 14)! Such is the often overt dishonesty in that camp). Of course, some IO might respond, “Well, yes, you did have some non-Israelites saved in AD 70, (a fatal admission) but, that just proves that all of the Gentiles were saved then also, and that excludes us today.” Wrong, as Revelation continues to reveal, and as we continue our Responding to the Critics work. Also under the 7th Trumpet was the deliverance of the Kingdom (11:15f) and the finishing (telesthosin, Strong’s #5050) of the wrath of God against Babylon (Revelation 15:8; 16:7f). That is the time not only of the passing of the Old Covenant creation, but the full bloom of the New Creation (Revelation 21:1f). The seventh trumpet is “the end of everything, the beginning of everything.” And this is a critical point. Both Romans 11 and Revelation posit the salvation of “all Israel” at the coming of the Lord. That is likewise the time of the fullness of the Gentiles – the salvation of the innumerable host from every nation. What the IO folks miss (purposefully ignore) is that the coming of the Lord for the salvation of Israel had always been foretold as the end of that Old Covenant world, but, the full arrival of a New World, radically different from the Old. The Old People were to perish as a nation, as a Theocracy (Isaiah 65:8-19). From the ashes would arise a New People, a New Covenant, a New Creation, that was always intended to be inclusive of all nations, not just of Israel (Isaiah 56-66). And that New Creation would be man, continuing to live on earth, but in a New Covenant relationship. This is proven in Revelation 20:10- chapter 22. Then I saw a great white throne and Him who sat on it, from whose face the earth and the heaven fled away. And there was found no place for them. And I saw the dead, small and great, standing before God, and books were opened. And another book was opened, which is the Book of Life. And the dead were judged according to their works, by the things which were written in the books. Everything about this shows that it is the judgment of the Old Covenant world. But, it is not just the judgment of Israel. As a host of sources show, according to the common thought in Israel, the entire world was judged on Israel’s feast days! According to the Mishnah there are four seasons when judgment is passed upon the world. (See Alfred Edershiem, The Tabernacle, 296). For the Jews, although they perceived themselves as the center of God’s concern, what God did with them and for them spread to the nations, both positively and negatively. That means, for instance, that IO is wrong to claim that the nations were not to be included in Israel’s salvation. That is a doctrine unknown in the literature. Revelation 20 is about the end of Israel’s exclusive relationship with God, and the coming in of the “universal” call of the Gospel. 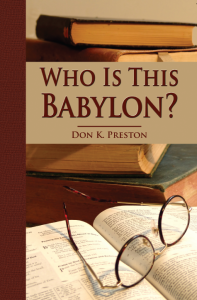 See my book, Who Is This Babylon? for a full discussion. Revelation 20 is a depiction of the final fulfillment of Israel’s last three feast days – the eschatological feast days of Rosh Ha Shanah and Yom Kippur and Succot that then resulted in Shemeni Atzerat – the New Creation. (I cannot develop that here, but it is incredibly significant). But, it is not only the fulfillment of Israel’s festal calendar, as the final fulfillment of “all things written,” it is the passing of “heaven and earth.” Remember that Jesus himself conflated the passing of heaven and earth with the fulfillment of every jot and every tittle of the law (Matthew 5:17-18). This is precisely what is depicted here in Revelation 20-22. Now I saw a new heaven and a new earth, for the first heaven and the first earth had passed away. Also there was no more sea. Then I, John, saw the holy city, New Jerusalem, coming down out of heaven from God, prepared as a bride adorned for her husband. And I heard a loud voice from heaven saying, “Behold, the tabernacle of God is with men, and He will dwell with them, and they shall be His people. God Himself will be with them and be their God. So, after the passing of the Old Creation of Old Covenant Israel, what do we find? As suggested just above, at the fulfillment of Israel’s final three eschatological feast days, we have Shemeni Atzerat – the New Creation. Shemeni Atazerat, taken from Leviticus 23, was the “eighth day” celebration, that took place the day after the last (seventh) day of the feast of Succot. That eighth day was a celebration of “surviving” the judgment and it was viewed as entering a New Creation. And in Biblical thought as well as rabbinic writings, that New Creation would be “on earth,” among men (Isaiah 65-66). Not only that, all men, of all nations including those who had never known the Lord, would be called into that New Creation (Isaiah 66:19f). That is precisely what Revelation 21 is depicting. Revelation 20 depicts the opening of the Books for the judgment of all men. In the Jewish calendar, the “Books” were opened on Rosh Ha Shanah (the Day of Judgment) and Yom Kippur- the Day of Atonement. With the judgment past, man could dwell with God (Succot). Revelation 20 is the depiction of the climax of Israel’s festal calendar and the consummation of her covenant history. Her “heaven and earth” fled away and there was no place found for her anymore. This was the end of everything. But, contra IO, that end of the Old Creation was not simply the end of everything. At the end of the Old, the New, “comes down from God out of heaven.” This is not– as the IO camp tries to convince folks – the removal of the church from the earth. It is not any kind of rapture. It is not the church “going up.” The church goes nowhere! It is rather, “the New Jerusalem coming down from God, out of heaven” with the declaration, “Behold, the tabernacle of God is with men, and He will dwell with them.” This is the restoration of the fellowship lost in the Garden. This is God’s presence restored to man, on earth, in the New Covenant creation. This is heaven and earth reconciled, as Paul discussed in Ephesians 1:9f, the eternal purpose of God, before time began. What was lost in Adam, (Before Israel existed), fellowship between God and man – on earth – is fully restored. Remember that this is the time of the finishing of the mystery of God. This is the salvation of “all Israel.” But, while it brings that Old Covenant Creation to its consummation, to its end, the New Creation comes into full bloom. And what does that mean? Once again, it is the Presence of God restored to man on earth. It is not man, or the Old Jerusalem, or the Old People removed / raptured from the earth. IO is defeated on this alone. It is the City, the New Jerusalem, whose gates are open night and day and the nations of the earth, are free to come into the city. In the IO paradigm, there should be no New Jerusalem on earth for the nations to enter. IO perverts this narrative. IO is defeated. What do the nations of the earth come into the city to find? They come into the city to find healing from the Tree of Life and to drink from the River of Life. It means that “sickness” exists – sin exists- outside the City, but that healing and forgiveness is within. This means of course, that evangelism exists in the New Creation. According to IO, there is no sin after AD 70, and thus, no need for healing, no evangelism. But, Revelation refutes that, and IO is defeated. We have seen that the IO position demands that Paul was concerned with numbers: the full number of Gentiles to ever be saved were saved in AD 70 at Christ’s coming. But, as we have seen, that is not supported in any way. The lexicons do not support “numeric fullness” as in any way an inherent element of pleroma. Likewise, the concept of numbers is not found in the antonym of pleroma, hettema, as we have shown. The translations do not support the numeric application of either hettema or pleroma. While there are a very small handful of translations that offer us “number” the great majority do not. Paul’s use of pleroma in all other passages where he uses that word never indicate a numeric fullness. Instead, when Paul discussed the fullness of the Gentiles in all other occurrences of pleroma, he was invariably concerned with their acceptance, by the Christian Jews, as equal participants of the blessings of the Gospel. For Paul, Gentile “fullness” was their full, equal status, along with Israel, in the body of Christ (Ephesians 3:3-8). The context of Romans 11 deals with the status of the Gentiles being grafted into the “one root” of the Abrahamic promises – along with Israel. Bring grafted in, with Israel, into that one root, implied very forcefully, that the “fullness” was not numeric, but had to do with Gentile equality with Israel in that one root. 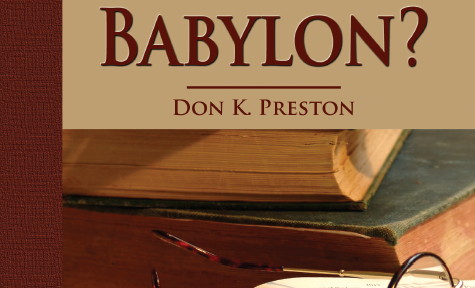 We have seen that the book of Revelation is a devastating refutation of the IO paradigm, because it unequivocally posits the salvation of “all Israel” but, it likewise affirms the salvation of countless numbers of those who were not of the twelve tribes. This is an utter falsification of the salvation for Israel Only view. A closing note and admonishment. Lamentably, the church has not always done even a passingly acceptable job of manifesting the “perfect man” and the “fullness of Christ.” Ethnic, racial, economic, even political barriers have (and still do!) plague the church and the Unity that Christ died to establish. But, because we as fallible and weak humans have failed to apply and to realize what Christ accomplished does not mean that his work failed, or that it ceased. It means that we must be better servants. It means that we must be willing, in many cases, to set aside our upbringing and prejudices, and reach out to those that are “not like us” showing a horribly divided, hate filled world, that there is indeed healing and equality in Christ. For the world to see it, we must live it! We must be the beacon of unity and healing! Each of us – each believer – bears this responsibility. This responsibility does not lie solely and exclusively on one group, on the Caucasians, or the Asians, or the African-Americans, or the Chinese, or the Mexican believers. It does not lie solely on the rich or the poor. There is no room for any kind of racism (and “racism” i.e. discrimination, can be social, ethnic, political, or economic) in the body of Christ (See James 2)! This responsibility is our’s equally! Each of us must show forth– to shine forth – the wisdom, the mercy, the grace, the glory of Christ who died for each and every one of us, with no distinction. This is the un-ending role, the responsibility, the task and the Glory, of the Body of Christ.